I’ve been avoiding cow’s milk dairy for the past few months for a variety of different reasons. Does that mean I have to give up ice cream? Nope! I discovered an amazing brand of vegan, soy free ice cream called Luna and Larry’s Coconut Bliss. It is made with coconut milk and it is truly blissful! It is creamy and delicious and even if you eat dairy, you should give it a try. Why? It’s made from amazing ingredients – in particular, coconut milk. Coconut milk is is super creamy and delicious but its fats are actually good for you! Unlike the cholesterol-laden artery-clogging fats in cream, coconut fats are high in medium chain triglycerides (MCTs). These MCTs are identical to those fats found in human breast milk, and contain similar antimicrobial and heart protective qualities. The breastfeeding advocate in me just loves this!! Fat in coconut is used differently by your body than other fats. MCTs don’t need to be broken down – instead they can be used by your body immediately as energy. In fact, coconut fat provides easily digestible energy that is ideal to consume before physical activity such as running, cycling or hiking. Coconut fat stimulates your metabolism! I buy Luna and Larry’s at Whole Foods or Noah’s Natural Foods here in Toronto and I definitely recommend that you try it. 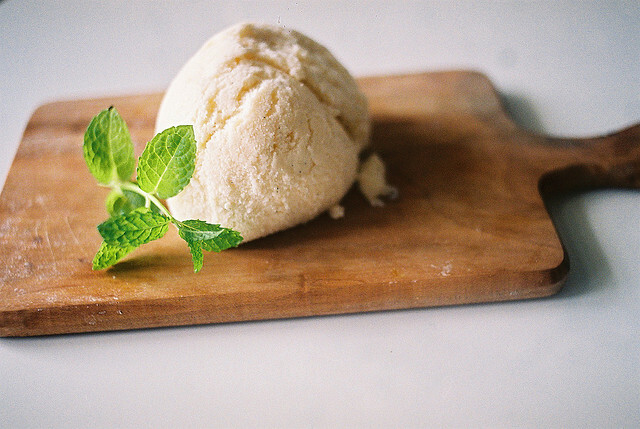 If you can’t find it in a store near you, I recently discovered that it is pretty simple to make your own coconut milk ice cream using the Vitamix. Mix your coconut milk, sweetener of choice and vanilla in a bowl. I didn’t list amounts because the amount you use is really personal preference. Start with 1 tablespoon of sweetener and 1/2 tsp of vanilla. Give it a taste and add more if necessary. Pour the mixture into an ice cube tray. Freeze for a few hours until solid. Place the frozen ice cube mixture into your Vitamix and blend! It will become creamy and delicious and take on an ice cream texture within seconds. Serve right away and ENJOY! Categories: Cooking, Food, Gluten free, Vegan | Tags: Coconut, coconut milk, Food, medium chain triglycerides, vegan | Permalink.